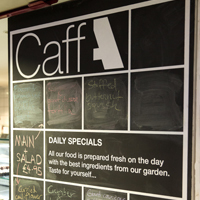 What you might not know about the Albany cafe is that one of our suppliers are Fare Share. 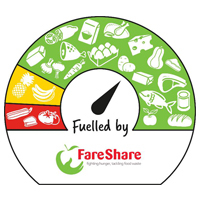 What is Fare Share? 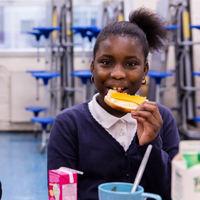 It is a company who collects fresh, tasty and in-date food that is surplus in the food industry and redistributes it to charities and community groups at a low-price. Not only does this mean we have more money to spend on the community, but it also helps us to continue to be an eco-venue as we are ensuring that no good food is thrown away! Why is the food surplus? The quirky thing about being supplied by Fare Share is that you never know exactly what ingredients you are going to get. You state your preferences e.g. vegetables but you could end up with a carrot or an aubergine, whatever happens to be surplus. Of course we do order from other suppliers, and we always have the vegetables we grow ourselves, but essentially our chef Brad is constantly having to think on his feet and come up with new and interesting recipes every week. We want to share some of Brad’s recipes with you, so we have started this Albany cafe blog where we will be regularly posting new autumnal recipes for you to try out. So watch this space. …So now you know that quiche isn’t just a tasty quiche it’s an Albany-eco-friendly-community-helping-brain-child-of-Brad-quiche! Yum. Thanks to the Albany Young Creatives, the magic of the legendary frost fayres will return to London on Saturday, December 2nd at Deptford Lounge with Frost Fest. Read the interview we had with Young Creatives member, Sheyamali Sudesh, to find out more about the event and the experience she has gained from planning the festival. What was your inspiration for the festival? The history of Deptford and London. Looking back on a place and celebrating the activities that took place there in the past is magical. It is exactly what is needed for a Winter Festival. How does Young Creatives differ from anything you’ve done before? I have been thrown in to the deep end – I have never programmed, project managed and helped out with marketing all at once – and especially not for a festival! I am learning so much in a short amount of time. What have you personally gained learned from this experience so far and what do you think you will learn? I have learnt how to work in a team that has a very diverse range of backgrounds and levels of experience in events management. I have learnt about budgeting and things to think about before allocating money to different causes. How will being involved have an impact on your future plans? I hope to gain paid experience (and a job!) at galleries or theatres. Tell us about the event you are organising? It is a winter themed festival called ‘Frost Fest’, exploring the frost fayres that took place on the frozen river Thames between the 17th and 19th century. We are jealous of the people that put on and attended the events – so we thought we would put on our own. Don’t miss your chance to attend Frost Fest on December 2nd from 11am to 4pm for live performances, delicious treats, craft workshops and guaranteed festive fun! COMPETITION: Create Your Own Elephant Story! On Saturday December 2nd Deptford Lounge is hosting the Frost Fest, a special reimagining of the historic frost fayres that entertained London during the frosty winters of the ‘Little Ice Age’ between the 16th and 19th centuries. The fayres took place on the River Thames, which would be covered in ice up to several feet thick in some places. All kinds of merrymaking would occur at these winter festivals, but one particularly fabulous display was the exhibition of performing animals. The circus was actually born on the ice at these fayres, with Chipperfield’s dating back to the Great Frost of 1684. As the years went by people became more daring, the spectacles more fantastic and the performing animals more crazy. One frosty day in 1814 a live elephant was brought onto the ice! Now the weight of this particular elephant isn’t recorded, but to give you some idea an average African bush elephant weighs somewhere between 3 and 7 tonnes. And one of these was actually walking on the Thames! No one knew where he’d come from, but that didn’t matter. The elephant was the star of the show. People from all over the city came to dance, laugh and celebrate with the animal. No one could have known it at the time, but the fayre of 1814 was to be the last festival held on the frozen Thames ever, for the river never froze again. The elephant has gone down in London legend, marking a special moment during the festive period as everyone stopped what they were doing to come together and celebrate the surreal and the magical. And now the elephant is returning for the Deptford Frost Fest! Come along to our magical modern imagining of the classic frost fayre for lots of live entertainment, arts and crafts and festive refreshments, as well as the chance to meet the Frost Fest elephant! In honour of its legendary background, we want you to create the elephant’s story: where did the elephant come from? How did it get to be in central London? What was it doing at a frost fayre and what adventures did it get up to in London? Make up a name for it and tell us what its hobbies are – the wackier the better! We’ll pick a winner which will be brought to life in a special performance on the day and will win the creator 2 free tickets to any spring 2018 show at The Albany theatre in Deptford. See below for how to enter. Simply fill out this form – and that’s it! Get creative, we’ll see you on the ice. P.S. There are also black and white Frost Fest leaflets hanging out at Deptford Lounge – colour one in and post it in the box to be entered into a raffle for 2 free tickets to any spring 2018 show at The Albany theatre in Deptford. All entries will receive a small prize. Ever wondered what 360° sound is like? We sat down with Warsnare ahead of his live show at The Albany. Ahead of Warsnare’s debut live show ‘Warchestra 360°’ at the Albany Theatre on November 24th we managed to catch up with Deptford’s Daniel Potter for a little chinwag! Being a native South East Londoner, and holding your debut live with us at The Albany is a truly local affair. How does it feel to performing a show that must be very important to you so close to home? I have pretty much always lived in SE London. I’ve studied here, I’ve partied here, organised gigs here, culturally, socially and politically it is such an incredible place. I used to organise rock gigs here as a teenager, drum and bass nights as a slightly older teenager and as an adult I have organised concerts, electronic music raves and the Trailer TV which was a weekly electronic music broadcast/party in a disused lorry trailer next to the Deptford Creek where we previously used to interview artists, play their videos and have them perform to us and an enthusiastic audience inside the trailer. Although very much under threat from gentrification there are loads of cool little venues that support independent music whether live or DJ’s. We have incredible creative educational institutions very close by such as Goldsmiths and Trinity Laban that attract some of the most talented artists from around the world and smaller but equally as important music charities like The Midi Music Company that give incredible support to local emerging artists. The Deptford X festival happened recently including some awesome sound installations very close to my house and there are lots of other events like this. When organising a gig, I will always consider doing it locally first, the area is literally exploding with art and living on Deptford High Street I really feel like I am in the epicentre of it all and it is very inspiring. I’ve been to some great gigs at the Albany over the years, I remember going to see theatre shows there as a child, it is also literally a stones throw from my house and I am working with local artists and lifelong friends on this project so it feels very special indeed! Tell us a bit about some of the other live collaborators taking part in the performance? The musicians performing the album on the night include some very good lifelong friends of mine, Charlie Stark and Vienna Shilling are great locals singer/songwriters who you need to check out for their own personal projects. I’m privileged to be close to such talented singers and I can’t wait for you to hear their voices spatialised live on the 360° system. Charlie Stark recently released an incredible EP called UFO. Check out his entertaining new UFO video (https://www.youtube.com/watch?v=TAPfLYxE2pw). Alison D’Souza and Tristan Horne are playing the string parts on Viola and Cello. They actually recorded and co-wrote most of the string parts on the album itself so it is perfect to have them involved in the performance, as well as being top class professional musicians they bring some really creative ideas to the project and are able to do pretty much anything when it comes to string playing. Ben Hartley will be playing the percussion parts, I’ve taught music alongside him for a few years and always wanted to work with him in some sort of way and this seemed like the perfect opportunity. He is a very diverse musician, he can improvise where needed and recreate material from the album will precision accuracy too. Vocalists Kate Tempest and Laura Lopes also feature on the album but unfortunately can’t make the gig as they’ll be abroad but we will be performing the tracks they are on and spatialising their studio vocals on the 360°. As well as working closely with Tom from C&R to spatialise the album in 360 we have an extremely talented mixed media visual artist Jake Strickland producing some very interesting visuals where he’ll be hanging displays between the speakers surrounding the audience using Raspberry Pies. For those of us who don’t know, can you explain what 3D sound is? The term basically refers to audio technology that allows sound designers and composers create fully immersive sonic environments by placing and moving sound anywhere around 360 sphere. It is most often used in VR, video games and 360 video to construct realistic soundscapes. Most people will have experienced some form of surround sound at the cinema. How are you using 3D audio in your live show? I have been working with immersive audio specialists Call & Response at their ambisonic studio in South London to mix my stereo album into full 3D audio. If you think that most music people listen to is in stereo, so two loudspeakers or headphones. The mix engineer can place sound either to the left, right or centre of a stereo image. For this gig we are going to have 29 loudspeakers arranged in a dome that is over 10 metre in diameter. This means I can place sound pretty much anywhere I want. It adds a whole new compositional layer. We’re also using live string players, percussion and keys. The live sound will also be moved around the sphere. Warchestra 360 is the live performance version of Warsnare’s forthcoming album on Infinite Machine, out in Feb 2018. Warsnare plays the Albany on Friday 24 November at 7.30pm. Book tickets here. What is a London frost fayre? Between the 16th and 19th centuries Britain suffered what has been dubbed the ‘Little Ice Age’ by the storytellers and ‘a modest cooling of the Northern Hemisphere’ by the experts. This bout of cold was caused by volcanic eruptions across the globe and touched many countries throughout Europe, but particularly Britain. Old Jack Frost settled in hard when winter came around during those years. In London, a shallower and wider Thames combined with a fat, saggy Old London Bridge caused ice to form on the river easily. In fact, the Thames frequently froze over – up to several feet thick in some places! Imagine if that happened now! The whole city would stand still, dumbfounded. In fact that’s pretty close to what happened. Today, it would most likely cause chaos, but back then it caused celebration. All along the Thames, from London Bridge to Westminster, festivals called ‘frost fayres’ sprung up on the thick ice, where people from all over the city came together to share in the joy and hilarity of a frozen River Thames. Invented by the ferrymen of the river who suddenly found themselves out of business and in need of money (they charged a small fee for access to the ice – we however believe fun should be free for everyone! ), these fayres featured a variety of entertainment, including music, dancing, football, ice-skating, bowling, archery, bull-baiting, shopping, eating, drinking, singing and even, if you’ll believe it, fairground rides! On the Thames! There were performances of all kinds, as the fantastical event spawned even more fantastic spectacles. The famous Chipperfield’s Circus, which is still running to this day, began with performing animals on the frozen river in 1684. As for refreshments, there were BBQ’s, mini-pubs and stalls that sprang up all over the ice selling spiced ale, wine, toffee apples, hot chocolate and freshly baked gingerbread. The disused boat sails and oars were used as props for tents that sold toys and all kinds of crafts. A printing company called Croom created small postcards on the ice that included the customer’s name, the date of the frost fayre and the slogan ‘Printed on the Ice’. The whole affair was such a novelty that winters in London were associated with the fun of the fayres long after the river stopped freezing. A poem dedicated to the celebrations (reprinted below) is engraved under the southern end of Southwark Bridge. Although the ice will never come back, that doesn’t mean we can’t have as much fun as the people of London during the frosts of the Little Ice Age. Come to Deptford Lounge on Saturday December 2nd, 11-4pm, for Deptford’s very own frost fayre inspired Frost Fest, featuring live music, singing, dancing, storytelling, hot chocolates, spiced wine, craft workshops and lots more frosty, festive activities. Check back for how to enter our special Frost Fest Elephant Competition! Frost Fest is on at Deptford Lounge on Saturday 2nd of December from 11am till 4pm. This is a free event. We’re so excited to have you play with us at the Albany, what does it mean to you to perform in a local venue as a South London based band? We’re so thrilled and excited to be a part of the festival and to be playing round the corner from where we all live is an amazing feeling. It’s such a big music scene full of life down here and I know The Albany does so much good work for the community so it definitely feels extra special to be a part of the London jazz Festival in this way. This is the second time you’ve performed as part of the London Jazz festival, what do you think the festival means to jazz lovers in the city? I think the festival gives an opportunity for jazz lovers to see a lot of high quality gigs in short space of time, and the vibe in the city is always really exciting during the festival, as a musician it’s great to be able to go out and know there will be a hang at most venues every night. Having said that gigs are constantly happening all year round in london at underground venues, people should definitely look out for those and support the amazing music scene in this city. Who’s your favourite jazz act of the moment? Joe Wright. An absolutely incredible saxophone player, writer and instrument inventor, get to know. If you guys were going to go out for a night in South London where would you go? We love Bussey building in Peckham. They always put on amazing events and that’s actually where we launched our first EP a couple of years back! What can people expect from a Native Dancer gig? You can expect an honest, engaged performance. We always try to get lost in the moment and keep some things very loose so both the audience and ourselves can feel connected and make the night feel special. Native Dancer play the Albany on Saturday 11 November as part of the EFG London Jazz Festival, with support from Sawa-Manga. Doors are at 7.30pm. Tickets from £12.